Parents rarely have troubles with their child's imaginary play when that play involves dolls or stuffed toys. But when you catch your toddler actively interacting with no one and nothing, you begin to worry that perhaps something is not normal. Starting when they are about two and a half years old, toddlers often develop an imaginary friend. Sometimes, your toddler will develop a whole group of imaginary friends. Although some people see this behavior as unusual, the reality is that as many as two-thirds of toddlers have an imaginary friend at some point, making it a perfectly healthy type of behavior. The common misconception is that only lonely children have imaginary friends. In fact, most children who have imaginary friends come from very loving families and have friends at daycare and school. 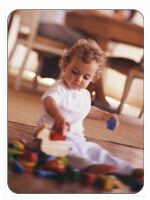 Toddlers form imaginary friendships because they are looking to exert control in their lives. Your son can't decide when he wants to go to daycare and his friends don't always want to play the way he wants them to. But his imaginary friend will do whatever he decides. While some people view imaginary friends as detrimental to a child's development, studies have shown the opposite. It takes a very creative child to think up and continue an on-going saga about an imaginary person. So, it's not very surprising that research has shown that children with imaginary friends tend to be more creative, independent, happy and co-operative. And that's all the more reason to welcome your toddler's invisible friends into your home. An imaginary friend doesn't just act as a companion to your toddler. Imaginary friends can be protectors, scapegoats, a conscience, or an emotional outlet. They can exist by themselves or they may come accompanied by a gang of other friends. Some imaginary friends visit everyday while others only stop by once in a while. They could be female or male, an animal, or something more ethereal. This friend could have super-human strength, magical abilities or funny looking hair. When your toddler comes home with her new invisible friend, be a gracious host and accommodate her new friend. But don't go overboard in your graciousness. It's fine to set an extra place at the table when it is just you and your toddler for lunch. If you're having all your relatives over, though, you may want to let your son know that Snooker will have to eat somewhere else today; there just isn't any room at the table. Allow your child to enjoy their friend as much as you can. However, keep in mind that your toddler is in control. Don't take the initiative and let your daughter know that Lulu has already gone upstairs and started brushing her teeth. This is her friend to control, not yours. If your toddler tries to blame their misdeeds on their imaginary friend, don't overlook the indiscretion. If your toddler spills their lunch on the kitchen floor, ask her to show Marty how to clean it up. Also, make sure you listen when your toddler says their friend is upset. Often, it is easier for your child to tell you that 'Polly' doesn't like it when mommy yells than it is for them to express that themselves. Eventually, your toddler's imaginary friend will disappear; whether they are simply forgotten or decided to return "home" is up to your toddler. Usually, imaginary friends make their exit by the time your toddler is five or six years old. Before and after the friends leave, you can encourage your toddler's creativity and imagination through reading and story telling. Stories with lots of characters and locations can really engage your toddler. Or you may want to ask your child to tell you a story instead of reading one to them. Although imaginary friends are a perfectly normal part of growing up, there are times when they can point to other problems. If your toddler doesn't seem to have any other friends, has begun withdrawing from people or appears unhappy, make an appointment with your toddler's pediatrician to discuss the issue.